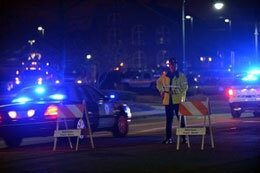 A police officer mans a check point in Watertown, Massachusetts as a search for the second of two suspects wanted in the Boston Marathon bombings takes place. Watertown, MA — Authorities are now learning the names and motives behind the suspects responsible for the deadly Boston Marathon bombings that rocked the nation on Monday. All of this comes just hours after one of two suspects was killed early Friday in a violent standoff with the police in a quiet residential neighborhood just west of Boston. The second suspect remains at large following what authorities describe as a deadly crime spree that left one police officer dead and another seriously wounded. The two men have been identified as Dzhokhar A. Tsarnaev, 19, and his brother Tamerlan Tsarnaev, 26 of Cambridge, Massachusetts. Tamerlan was killed by police in Friday’s early morning firefight. Dzhokhar is still on the run after a daring shootout with police that some describe as a scene straight from an action movie. In the middle of the gunfight, a pressure cooker was thrown at police that detonated. These pressure cooker bombs were the same explosives that were used in the Boston Marathon bombings. The devices were filled with nails, bearing balls, and black gun powder which could be triggered by kitchen-type egg timers. If anyone has any information on the whereabouts of Dzhokhar A. Tsarnaev police are urging you to call (785) 273-0325. They say he is armed with deadly pressure cookers and is considered extremely dangerous. [Updated at 04-19-13 | 5:10 PM PDT] The second suspect has been apprehended by police. There is nothing in life to ever be afraid of now.